We had spent many trips to all the different fabric stores hunting for peacock themed fabric. Even before that, we had already searched all the department stores, discount stores, and everywhere else we could think of for anything peacock. We were able to find pictures for the walls and a couple of pillows, but no blankets or comforters or other accessories for a bedroom. For my daughter's tenth birthday, we had promised her she could have her own room. She chose a peacock theme based on her favorite colors. I didn't realized peacock items would be so hard to find since they seemed to be gaining popularity. What we decided to do was go with a solid color teal comforter and add peacock details. I finally found this blue and teal peacock feather fabric at my local fabric store. It just happened to be 50% off too! 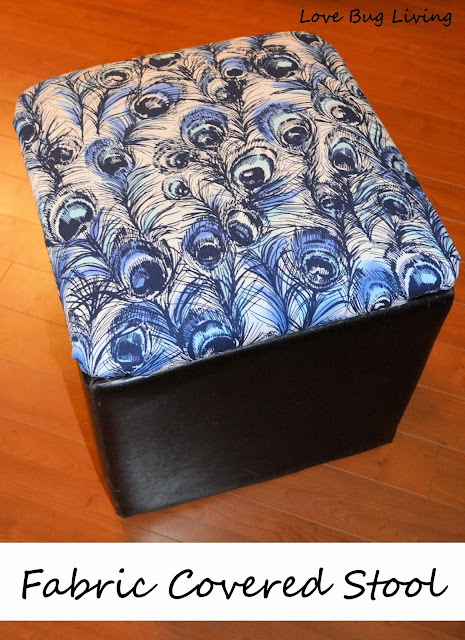 I bought a yard of the home décor fabric for these Fabric Covered Stools and a couple of yards in the regular fabric to make some other coordinating projects. I'll share those with you soon! 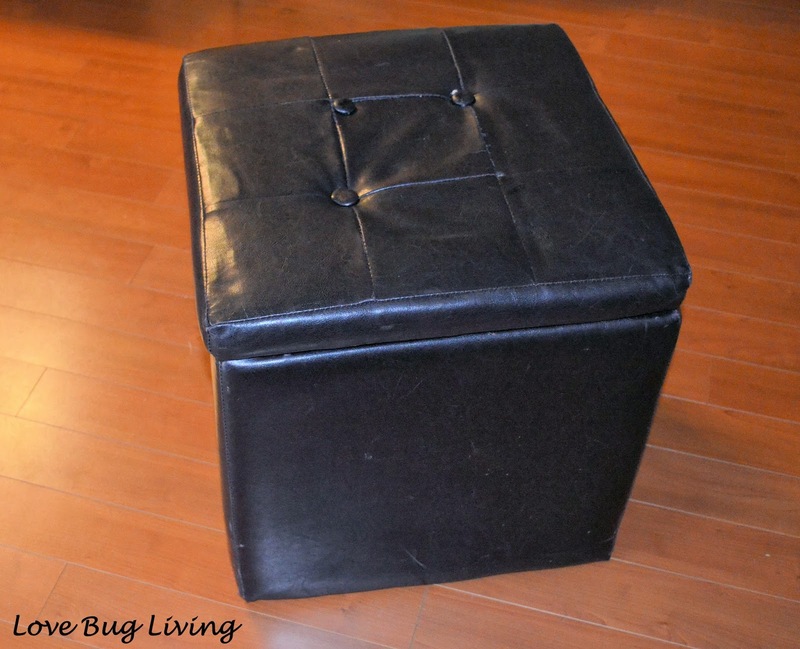 We have two of these faux leather stools and they have been in our house for some time. They started off in our family room as ottomans. After they started to show some wear, we moved them into the girls' playroom for them to use as stools and for storage. Now they are even more worn and could really use an update. You can see that they are missing some buttons and there are some cracks in the material. The bottom pieces of the stools were okay, so we decided to just cover the stool lids. The bottom of our stool lid had a fabric cover. I removed this carefully so that I could reuse it after I changed the top fabric. I also cut off the remaining buttons on the top of the stool lid. The rest looked okay, so I decided to just add my fabric over the existing leather cover. I was hoping this would make the lid more durable and protect my fabric from rubbing on the rough wood edges of the lid base. Lay your fabric with right side down. 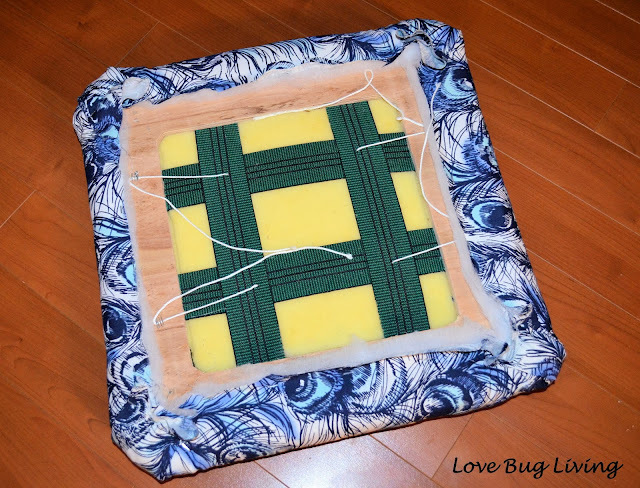 Lay a piece of batting on top of your fabric and then place your stool lid on top. 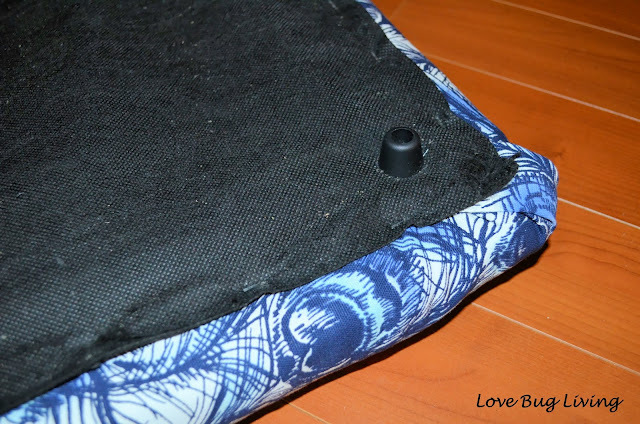 Your fabric should be large enough that the sides can be folded around the edges of your lid and stapled in place. Starting in the middle of one side, fold up your fabric and batting, and staple in place. Continue stapling, moving to the sides. Next you will do the same on the opposite side of your lid. 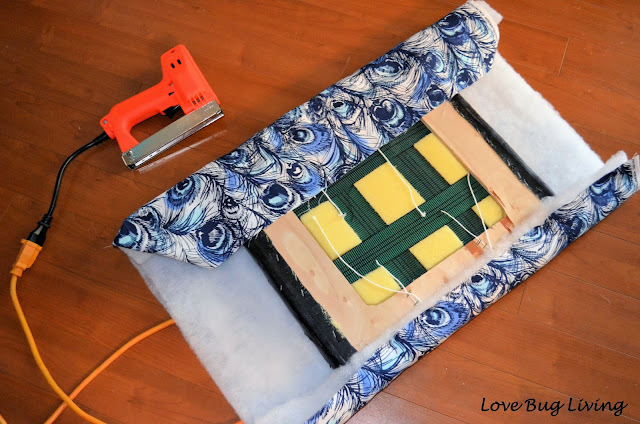 Be sure to pull your fabric tight and again start stapling in the middle and work your way out. 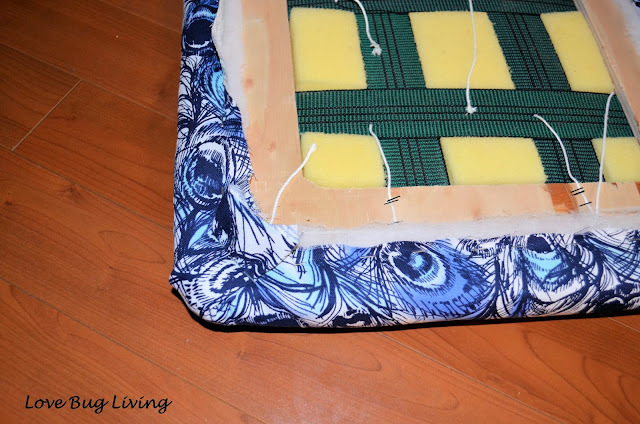 Do the same thing for each of the other two sides, being sure to pull the fabric tight and always starting in the middle and working your way out. I left my corners for the end. Trim any extra material. Fold your fabric, so that you can get it the flattest. I stapled my edges almost all the way to the corner and then pulled the very corner piece straight in, stapling it in place. Trim the excess fabric all the way around. 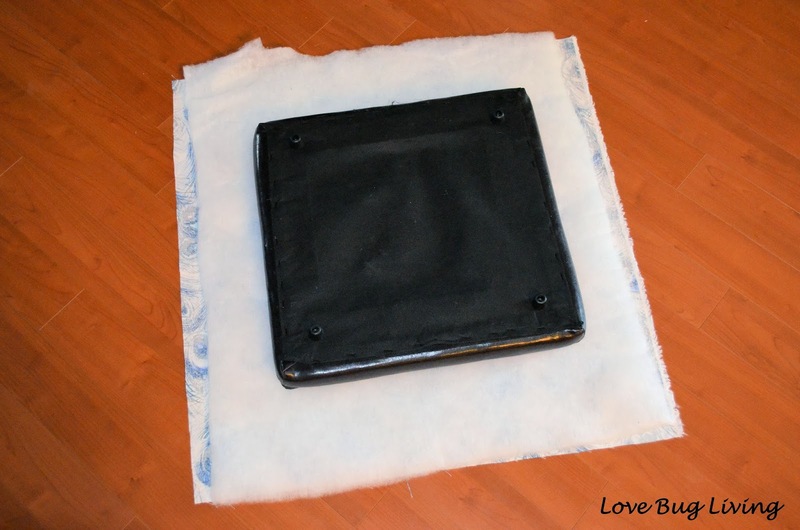 Reattach your fabric covering to the bottom. If yours isn't usable, you can leave it without one. If you would like, you can cut a piece of fabric the same size as your lid. Fold under the edges all the way around and iron them back. 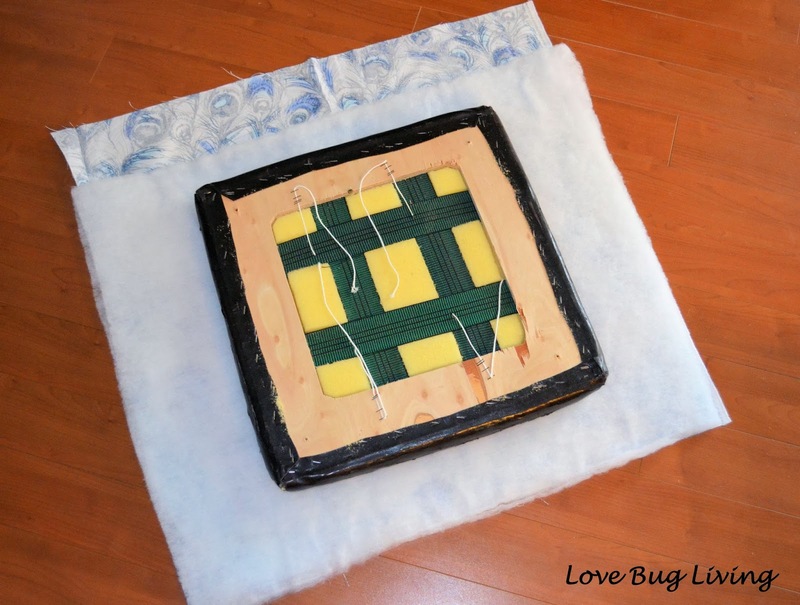 Now use this piece to cover your lid bottom by stapling in place. 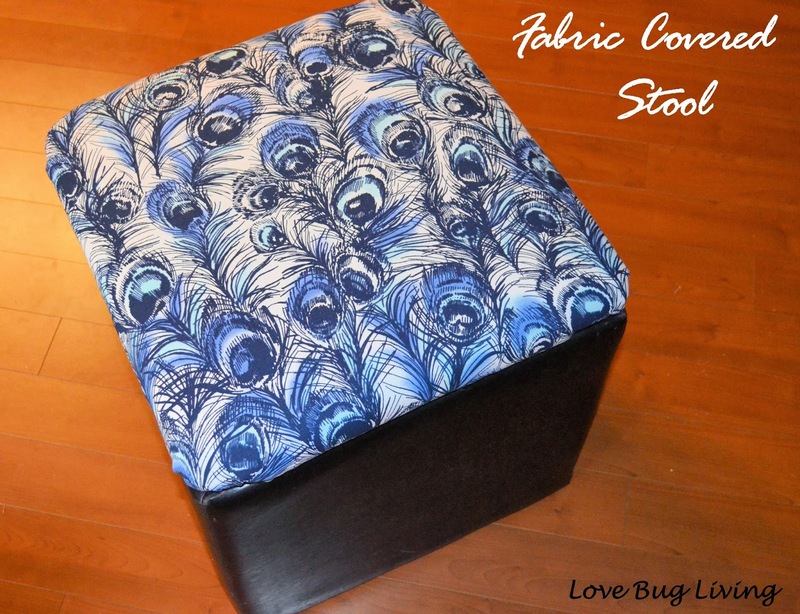 The peacock fabric covered lids gave these stools new life. They are perfect for seating or storage at the end of our daughter's bed. I love that we got to recycle, renew, and save money with these Fabric Covered Stools! Fun update! I used the peacock prints to reupholster my dining room chairs during my dining room makeover and just adore that print! Great job!. Coming over from TT&J.